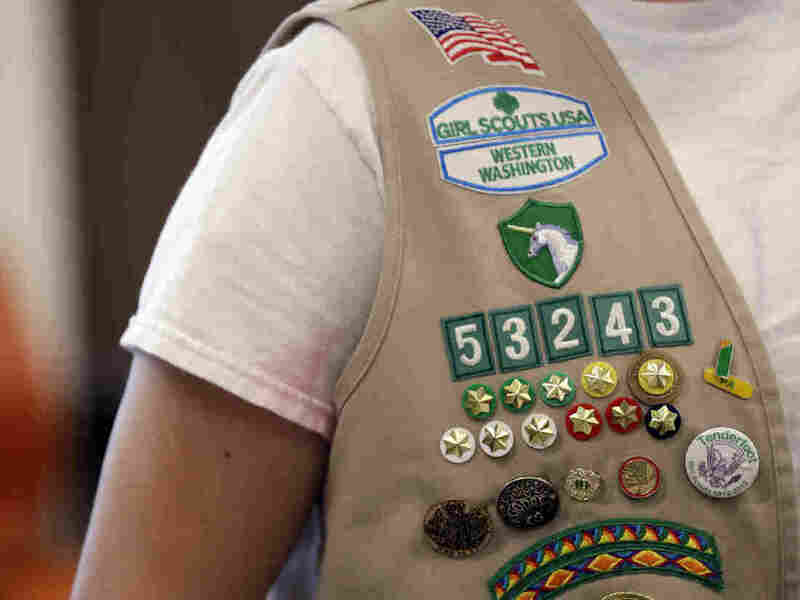 Girl Scouts Of The USA Files Suit Against Boy Scouts Of America The girls' leadership development organization is accusing the Boy Scouts of trademark infringement, after it started admitting girls as well as boys. That decision was strongly decried by the Girl Scouts. In a scathing letter released by BuzzFeed News, Girl Scouts National President Kathy Hopinkah Hannan accused the Boy Scouts' national president at the time, Randall Stephenson, of carrying out a "covert campaign" to recruit girls. Hannan stressed the century-old working relationship between the two organizations. "We are confused as to why, rather than working to appeal to the 90 percent of boys who are not involved in BSA programs, you would choose to target girls," she wrote. When the Boy Scouts announced it would start to admit girls, it said that it made the decision after years of requests. It also expected programs that serve the "whole family" would be more convenient and appealing to busy parents, to single parents and in some minority communities. On Wednesday, the Boy Scouts said it is reviewing the lawsuit. In an emailed statement, it added: "We applaud every organization that builds character and leadership in children, including the Girl Scouts of the USA, and believe that there is an opportunity for both organizations to serve youth in our communities." In the complaint filed Tuesday in the U.S. District Court for the Southern District of New York, the Girl Scouts argue that the Boy Scouts' use of certain trademarks is "both new and uniquely damaging" to the organization. One of the Boy Scouts' programs is called Scouts BSA, which caters to boys and girls 11 to 17 years old. The organization also recently launched a campaign called "Scout Me In." It's the generic use of "Scouts," without a gender marker, that the Girl Scouts object to. Boy Scouts say it currently has "more than 2.4 million youth participants" – according to Reuters, that's "less than half of its 1970s peak." Girl Scouts says it has "1.8 million girl members." Not all Boy Scout groups are co-ed. "Starting in 2018, families can choose to sign up their sons and daughters for Cub Scouts," the organization wrote in October. "Existing packs may choose to establish a new girl pack, establish a pack that consists of girl dens and boy dens or remain an all-boy pack," and "Cub Scout dens will be single-gender — all boys or all girls." While the Boy Scout's October decision dramatically expanded its offerings for girls, the organization points out that it has had co-ed Exploring and Venturing programs since 1971. The Girl Scouts are asking the Boy Scouts to stop using stand-alone terms like "Scout" or "Scouting" and to train its troops and leadership accordingly. The organization has asked for a jury trial.